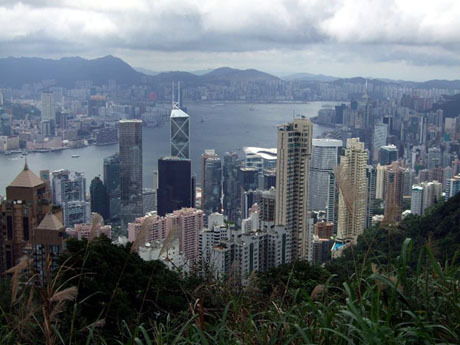 The Peak is one of Hong Kong’s major tourist attractions and a “must visit” destination for visitors. Dominating Hong Kong Island this mountain (552 metres at the summit) offers spectacular panoramic views day and night across Hong Kong Island, Kowloon, parts of the New Territories and several of Hong Kong’s outlying islands. The Peak also has some of the most expensive and desirable residences in the world and is home to celebrities, leading government officials and company taipans. 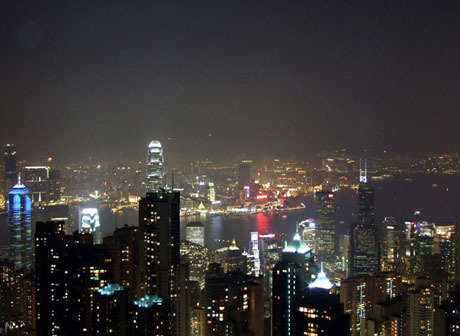 In summer a visit to the Peak where temperatures are often 5C lower than at sea level can provide cooling relief from the humid heat in urban areas below. However mists and low cloud all too often swirl around the Peak restricting views and to enjoy the Peak at its best it is advisable to try and choose a clear day. 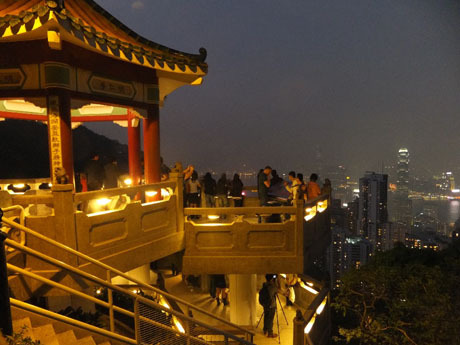 The Peak is to most visitors the area around the Peak Tower, arrival point for the Peak Tram, and the Peak Galleria where there are shops, restaurants, café’s, viewing galleries and entertainment attractions. However the Peak has much more to offer in the form of scenic walks, tranquil gardens and a country park. 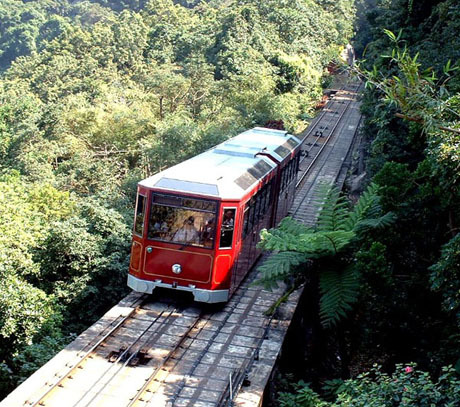 PEAK TRAM – The Peak Tram climbs seemingly almost vertically from its lower terminus next to Hong Kong Park to the Peak Tower in an exhilarating seven minute ride with spectacular views. The Lower Peak Tram Terminus is located on Garden Road and is served by New World First Bus (NWFB) route15C from outside Star Ferry Pier (Central Pier 8) on Hong Kong Island) and which also stops outside City Hall on Connaught Road Central. The service operates daily from 10am until 11-40pm and the journey takes about 10 minutes. The adult fare is HK$4.2. An open-top bus previously used on this service was withdrawn in March 2014 and the service is now operated mainly by single deck bus. Bus 15C outside Central Pier 8 (adjacent to Star Ferry Pier - Central Pier 7). See separate section PEAK TRAM for more information about the Peak Tram. 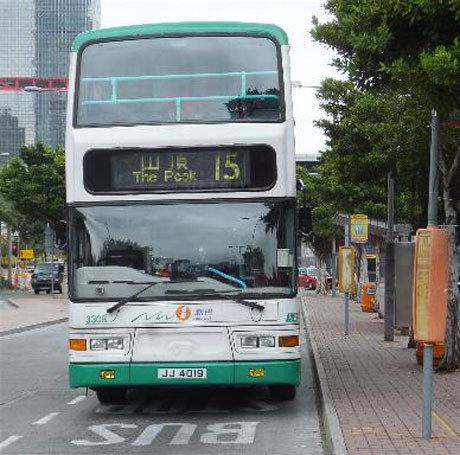 BUS 15 TO THE PEAK – New World First Bus (NWFB) service 15 (fare HK$9.80) from Central Ferry Piers 5 (Cheung Chau Pier)* and 6 (Mui Wo / Peng Chau Ferry Pier, adjacent to Star Ferry Pier)* provides a scenic journey to The Peak and terminates at the bus station under the Peak Galleria adjacent to the Peak Tower and Upper Peak Tram Terminus. From the upper deck there are spectacular views over Wan Chai, Central and across the harbour to Kowloon as the bus climbs the twisting Stubbs Road up to The Peak. 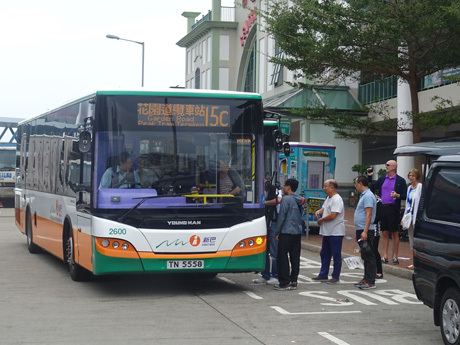 This bus can also be boarded at Exchange Square Bus Station and on Connaught Road outside City Hall, Queensway in Admiralty and Queens Road East in Wan Chai. The service operates from every 7/15 minutes daily from 06-15 to 00-15 and the journey takes about 40 minutes. New World First Bus (NWFB) service 15B (fare HK$9.60) from Wan Chai (Hong Kong Convention & Exhibition Centre Extension) via Causeway Bay and Stubbs Road. Frequency every 20 minutes from 12-00 to 19-00. Journey time approx 30 minutes. GREEN MINIBUS 1 TO THE PEAK - A faster bus service to The Peak is provided by Green Minibus number 1 (fare HK$9.2) although the views are not quite as scenic as those provided by the above franchised double deck bus services. 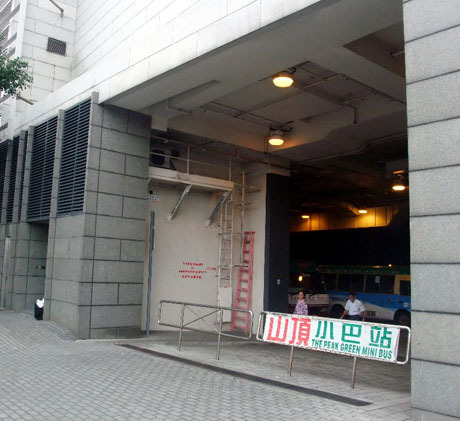 The service starts from Hong Kong Station Public Transport Interchange (MTR Hong Kong Station Exit E1) which is located under the Four Seasons Hotel end of IFC Mall (the Green Minibus Terminus is somewhat hidden away behind the main bus terminus). The service travels via Connaught Road (where you can board near City Hall) and Peak Road and terminates at the bus terminus under the Peak Galleria adjacent to the Upper Peak Tram Terminus. On its upward journey only it makes a diversion via Mount Kellett Road and Matilda International Hospital. Journey time is about 30 minutes on the upward journey and about 20 minutes on the downward journey. The service operates a 5/12 minute frequency from 06-30 (07-25 on Sundays and Public Holidays) to midnight. 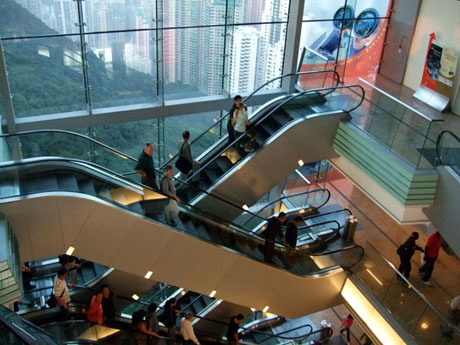 On the return journey from The Peak, passengers can disembark in Central on Ice House Street, Peddar Street outside Central MTR Station, Two IFC Tower or at the terminus. The current Peak Tower was built originally in 1997 but a major refurbishment took place over a two year period during 2005/6 which included the internal structure being completely rebuilt, panoramic windows installed and a new viewing terrace being built on the roof. The refurbished Peak Tower reopened during November 2006. 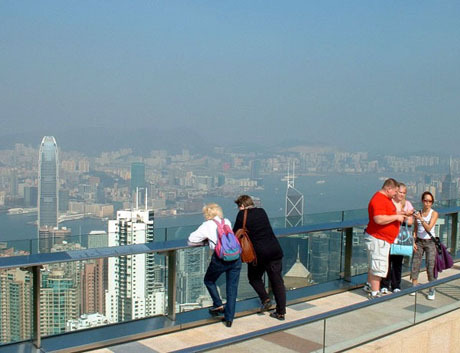 The tower opens from 7am to midnight and admission is free but there is a charge to enter the rooftop Sky Terrace 428. which is Hong Kong's highest viewing platform standing 428-metres above sea level. The tower has six levels and a roof terrace. The lowest level, podium 2 has souvenir shops. Podium 1 is the arrival level for the Peak Tram and has Peak Market, souvenir shops, Tang Dynasty Costume fashion and accessories shop, post office, Travelex foreign currency exchange, cafe and Madame Tussauds waxworks. The Ground floor is the departure level for the Peak Tram and has shops including Adidas, Crocs, Sunglass Hut, BSX, Giordano, Hard Rock Cafe Shop, Pacific Coffee, watch and jewellery shops including Swatch and Swarovski, juice bar, gelato shop, and jewellers. 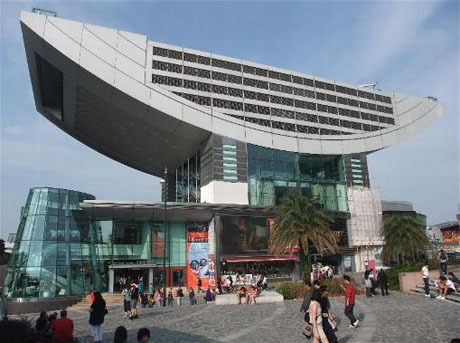 Level 1 is home to Burger King and Pearl on the Peak restaurants and "Madness 3D Adventure" a free interactive zone introduced in October 2016 featuring famous Hong Kong scenes and a photo shooting area where visitors can have photos taken by professional photographers set against iconic backdrops. From level 1 a set of vertigo inducing escalators lead up the open central core of the tower to level 2 where there are gift shops, TonyMoly fashions, Bank of China ATM, Japanese restaurant and Chinese restaurant which extends to level 3. On level 3 are photo shop, candy shop, Bubba Gump restaurant and Tien Yi Chinese Restaurant. SKY TERRACE 428 - From Peak Tower level 3 escalators lead to the Sky Terrace 428 which is open 10am to 11pm Monday to Friday and 8am to 11pm on Saturdays, Sundays and public holidays. Access is via turnstile for which there is a charge of HK$50, increasing to HK$52 from 1 March 2018 (half-price concessions for seniors and children). Payment can be made by Octopus Card or tickets can be purchased from the customer service desk on the ground floor or at the Lower Peak Tram Terminus. Visitors arriving by Peak Tram can purchase a combined ticket for the tram and Sky Terrace 428 which results is cheaper than purchasing separately. For more information see “Peak Tram”. 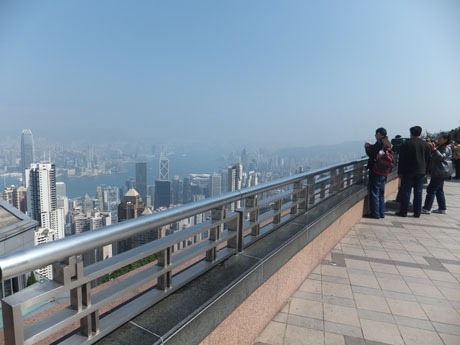 Views from the terrace, which is 428-metres above sea level and the highest viewing deck in Hong Kong, on a clear day are stunning. 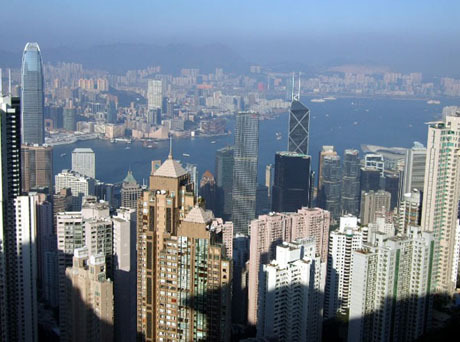 Visitors can see along the length of Victoria Harbour, the northern urban areas and harbourside of Hong Kong Island, all Kowloon and parts of the New Territories. There are fixed binoculars for which there is a charge and there are usually professional photographers touting for business. Also on Sky Terrace 428 is the Sky Gallery, an outdoor exhibition of local artwork. 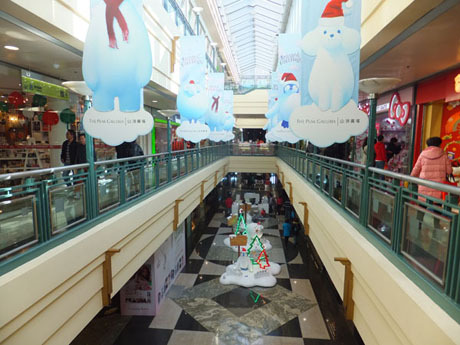 The Peak Galleria is located opposite the Peak Tower and houses gift shops, art shops, supermarket, bookshops, café’s and restaurants over three floors. Restaurants include Cafe Deco with spectacular views from two floors, Pho Yummee Vietnamese street food, Blossom Sushi, Maks Noodle, Tsui Wah Restaurant, Delifrance, Spaghetti 360, McDonalds and a Starbucks coffee shop. 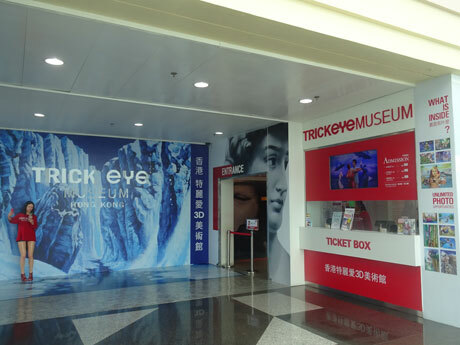 There is a 7-11 convenience store on the ground floor, and in December 2014, a Trick Eye Museum opened, located on level 3. The roof has a free viewing terrace and roof garden which can be accessed by an obsevation lift and, whilst the views are not quite as spectacular as those from the Peak Tower Sky Terrace 428, they are still very impressive. Peak Galleria's free viewing terrace. Renovation work in 2011 included installation of an observation lift to reach the terrace from the piazza. Note - The viewing terrace is closed from early 2017 for a period of about 2 years during major renovation work to the Peak Galleria. A small section of south-facing roof garden remains open at the opposite end of the Galleria. The basement of the Galleria houses the bus and green minibus terminus and taxi stands. Free wi-fi is available at the Peak Galleria. The Peak Galleria is fronted by a piazza for which a refurbishment programme was completed in mid-2008 as part of the Peak Improvement Scheme set up by the tourism commission. 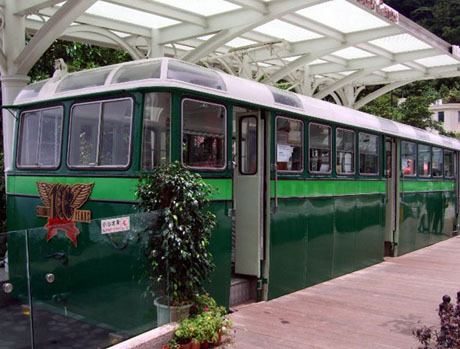 The piazza has outdoor café tables, seats, fountain and Victorian style architecture and is home to Hong Kong Tourism Board's Peak Visitor Information Centre housed in an old Peak Tram (see below) and is the venue for exhibitions and other events particularly at weekends. In August 2015 plans for a 20-second 120-metre "Flightlinez" zip wire ride between take off and landing towers at each end of the Peak Galleria were approved. The operator would be Canadian based forestry company Greenheart and the attraction would operate from 10am to 10pm with a capacity of 120 riders per hour. Technical studies are being carried out by the Hang Lung Properties, developer of the Peak Galleria and Greenheart and consultations will also be made with the government's Electrical and Mechanical Services Department over noise and safety issues. 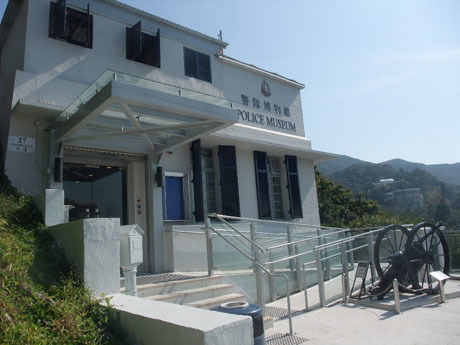 Hong Kong Tourism Board opened the Peak Visitor Centre in April 2008. 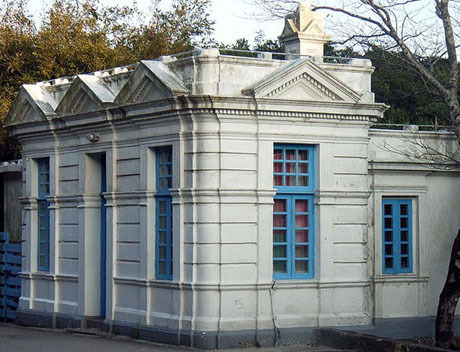 The centre is housed in a heritage Peak Tram cabin which was is service between 1959 and 1989 and is installed under a Victorian canopy. The centre is open daily from 9am to 9pm and provides a full range of visitor information services. 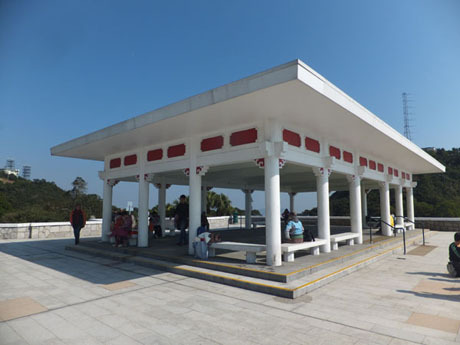 Just a short walk along Findlay Road alongside the Peak Tower leads to the two-storey Lions Lookout Pavilion which has also undergone a recent renovation. Both the pavilion and Findlay Road provide excellent viewpoints and photo opportunities. Also along Findlay Road are photographers and vendors offering paintings and souvenirs and quite often one of the few remaining rickshaw pullers touts for business although don’t expect anything more than a trip of a few metres and a photo. Victoria Peak Garden is a wonderfully peaceful, colourful and scenic spot near to the summit of Victoria Peak seemingly a world away from the frenzied crowds below. To get there follow Mount Austin Road (which starts almost next to the Peak Lookout Restaurant) uphill for about 15/20 minutes. On the way just past Mount Austin Playground is a viewpoint with more outstanding vistas over Hong Kong Island and Kowloon and the road also passes some of the most desirable residences in Hong Kong. Further up the hill the Gate Lodge of the Former Mountain Lodge (the Governor's summer residence) is reached at the entrance to the lower gardens on the left. Continuing up the road to the top of the hill the road ends at the site of the Mountain Lodge. The Governors former summer residence was once located here and the site of its remains has been renovated and is once again accessible to the public, having been declared an archaelogical site and screened off behind hoardings for a number of years. There is a viewpoint with views over the western side of Hong Kong Island, Lamma, Lantau and parts of Kowloon. The Governors Walk is a short gentle shaded walk winding round the perimeter of the gardens back to Mount Austin Road. The actual summit of Victoria Peak is dominated by transmission masts and it is possible to get very close to the summit by following the path from within the gardens towards the masts. Substantial redevelopment of the gardens has taken place over several years, being completed in early 2010, and a new pavilion, benches, sun-dials, stone pillars, carvings and gazebos have been installed to induce a Victorian style theme in these tiered gardens. The Peak has some wonderful tranquil and mainly shaded scenic walks. 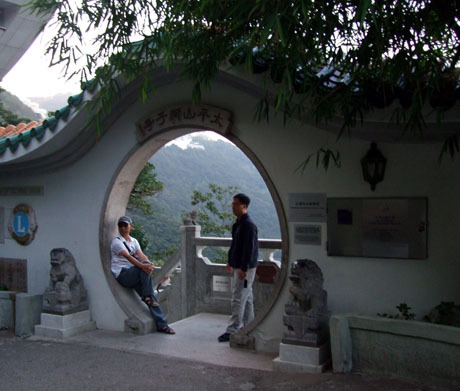 The most popular of these is the flat 3.5km circular walk along Lugard Road and Harlech Road which forms part of the Hong Kong Trail. These roads both begin near the Peak Lookout Restaurant and the walk should take around 45/60 minutes although most visitors will feel the temptation to stop and enjoy the outstanding views along parts of the route. If starting from Lugard Road the walk soon emerges from the shade of the heavily forested slopes of the Peak to allow stunning views over the northern side of Hong Kong Island, Kowloon and parts of Lantau. Further along at the junction with Hatton Road there is a recently renovated garden with picnic area and toilet facilities. 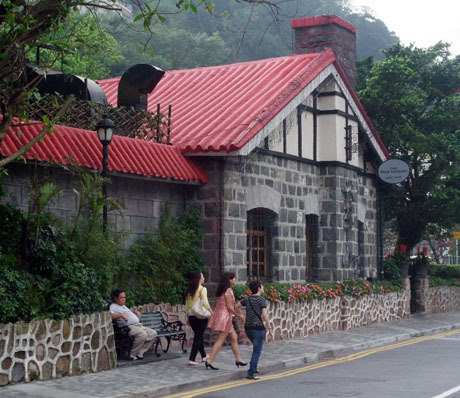 Continuing along Harlech Road there are views over Pok Fu Lam Reservoir and Aberdeen on the south side of Hong Kong Island and Lamma Island before reaching a waterfall and emerging next to the Peak Lookout Restaurant. For a longer walk instead of completing the circuit follow Hatton Road which descends steeply via the remains of Pinewood Battery, a historic military site, to Hong Kong University from where there are frequent buses to Central. 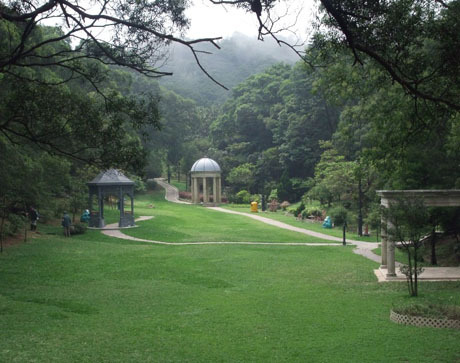 Opposite the entrance to the bus terminus under the Peak Galleria is the entrance to Pok Fu Lam Country Park. 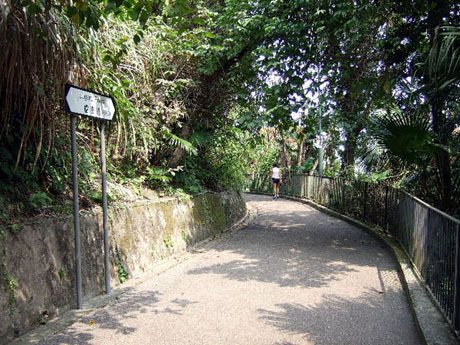 There is an easy and pleasant downhill and mainly shaded walk down the wooded southern slopes of the Peak through the park and past Pok Fu Lam Reservoir to Pok Fu Lam Road from where there are frequent bus services to Central (cross to the bus stop on the opposite side of the road) and Aberdeen (stay on the same side of the road as the park entrance). This walk should take no more than one hour. Alternatively for a longer walk when descending the main path through the country park follow the signs for “Peel Rise” along Stage 2 of the Hong Kong Trail. 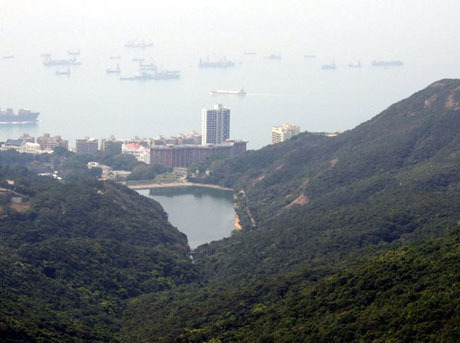 The trail which is undulating at first eventually opens out to provide dramatic views over Aberdeen, Ap Lei Chau and Lamma Island before descending and winding its way along a water catchment to Peel Rise. At Peel Rise leave the Hong Kong Trail and follow the path down to Aberdeen. Allow about 2 hours for the walk from the Peak. 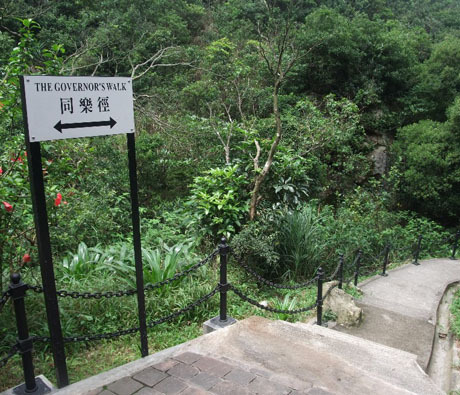 The Governor's Walk is a short walk around the perimeter of Victoria Peak Garden between Mount Austin Road and the site of the Mountain Lodge (see "Victoria Peak Garden" above). There are several paths leading from below the Peak Tower down through Mid-Levels to Central. The most direct route is to take Findlay Path (next to the Peak Tram tracks in front of the Peak Tower) down to Barker Road Station and then follow Old Peak Road, once a busy route for coolies hauling sedan chairs, between the towering residential blocks of Dynasty Court and Hillsborough Court, across the traffic lights at Robinson Road, down Albany Road, through Hong Kong Zoological and Botanical Gardens and down Garden Road to emerge near Hong Kong Park and the Bank of China Tower. Although downhill all the way this walk descends very steeply in places and is not suggested for those with weak knees. To walk from the Peak to Central takes about 40 minutes. There are a range of cafes and restaurants at the Peak offering alternatives from sandwiches and fast food to sophisticated international menus. The Peak Tower has a BURGER KING, PACIFIC COFFEE coffee shop, HONG KONG DAY, Hong Kong style cafe and JUNGLE JUICE juice bar. 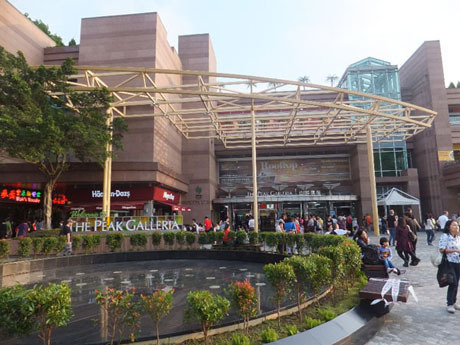 The Peak Galleria has MACDONALDS, DELIFRANCE, STARBUCKS and a PARK'N SHOP INTERNATIONAL supermarket which sells drinks and snacks much cheaper than most other outlets at the Peak. CAFÉ DECO (Café Deco permanently closed at this location on 24th July 2016 and relocated to the 20th floor, The One, Tsim Sha Tsui in September 2016) – located on two levels of the Peak Galleria with panoramic windows and outdoor balconies offering spectacular views over Hong Kong Island, Victoria Harbour and Kowloon this large international restaurant has an open kitchen and extensive menu. 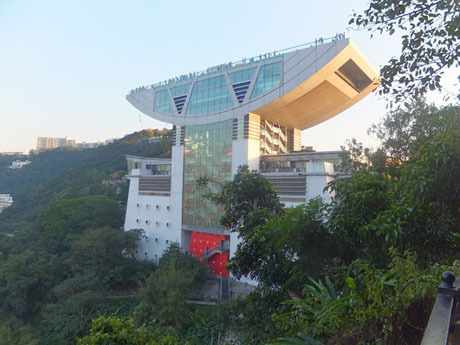 TIEN YI CHINESE RESTAURANT – on levels 2 and 3 of the Peak Tower the restaurant owned by RC Gastronomic has stunning views and a 6 metre high water wall. Speciality dishes include shark’s fins, bird’s nest and abalone. candlelit tables for two. There is a central sushi bar and teppanyaki counter featuring a “live show” performed by the restaurants chefs.